What can I say, Eddie sets a mean table. I've blogged about his tables here and here. Well, I'm at it again! 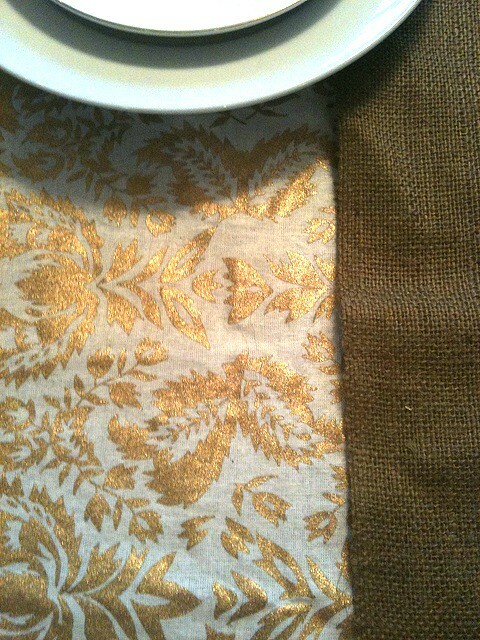 I found an amazing gold batik tablecloth from Home Goods this week that set the stage for my Thanksgiving table (more on that later). But this gold table from Eddie majorly inspired my styling. I cannot wait until Thanksgiving! I'll be sure to share pictures of the table in advance (I think on Monday). Great to see those pics of Eddie's table. Now I'm really curious to see what you do w/your table! I always love Eddie's tablescapes - love the peak at your tablecloth! he does such a beautiful job. Love your new table cloth too. I can't wait to see more...Eddie Ross is so talented, as are you! BTW, I gave you a little award because reading your blog is a delight! I'm always inspired by not only your great taste but your authenticity which always shines through. Thanks for the inspiration and have a happy day! I totally agree, Eddie Ross is the King of Tablescapes!! Can't wait to see what you'll do with your table! I'm inspired - thanks for sharing!! That fabric is beautiful! Can't wait to see the results! can't wait to see it all come together Bryn! I need to work mine out. I just don't have any china! wil have to figure out a way to make it work. I love yours. Can't wait to see more.